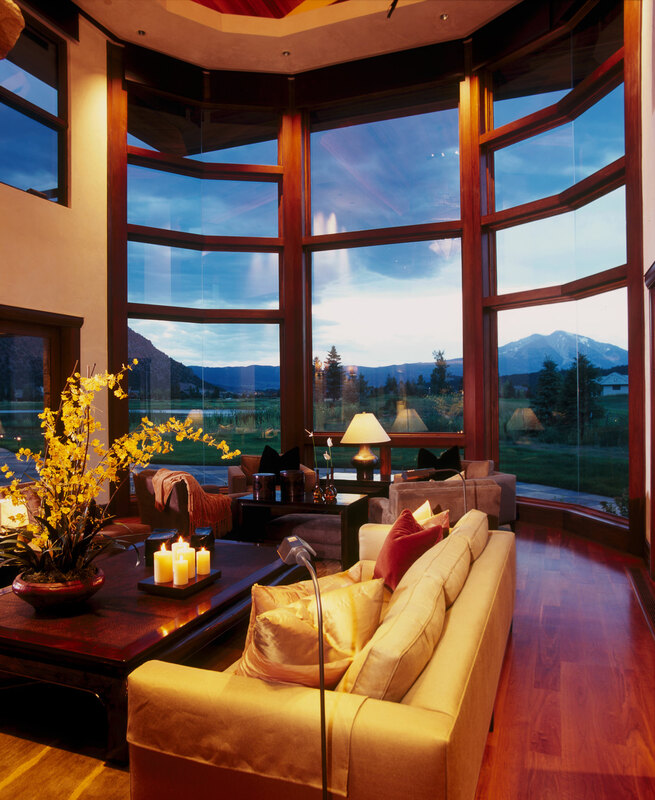 The clients wanted a Zen Mountain style home for their site that would capture the views of Mt. Sopris, the 18th fairway, and to convey a place of meditation and inspiration. 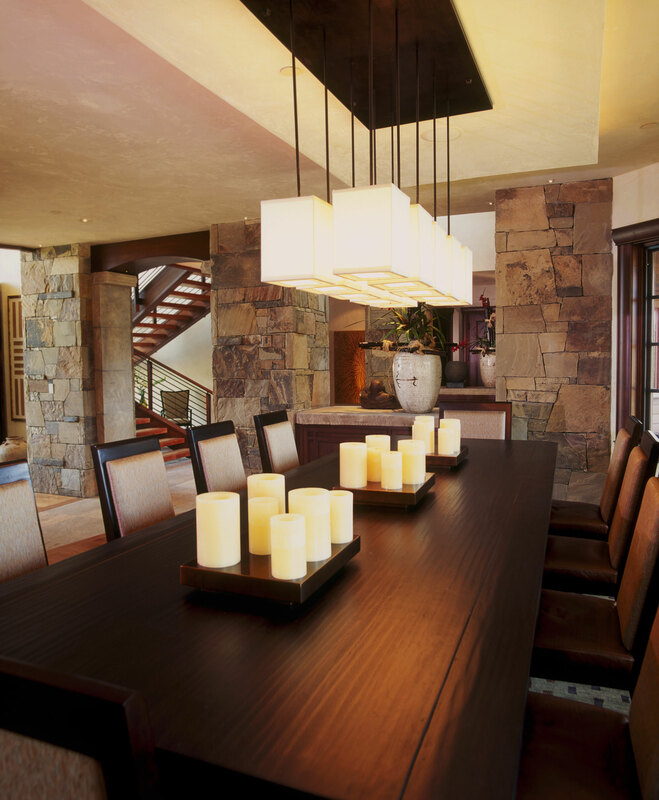 They were also after a family home that was informal and welcoming. The site was relatively flat adjacent to the 18th hole of the Golf course to the south with a water hazard on the east and a stream on the west and a dramatic view of Mt. Sopris in between. The spaces are arranged to compliment the site and to take advantage of the intimate and distant vistas. 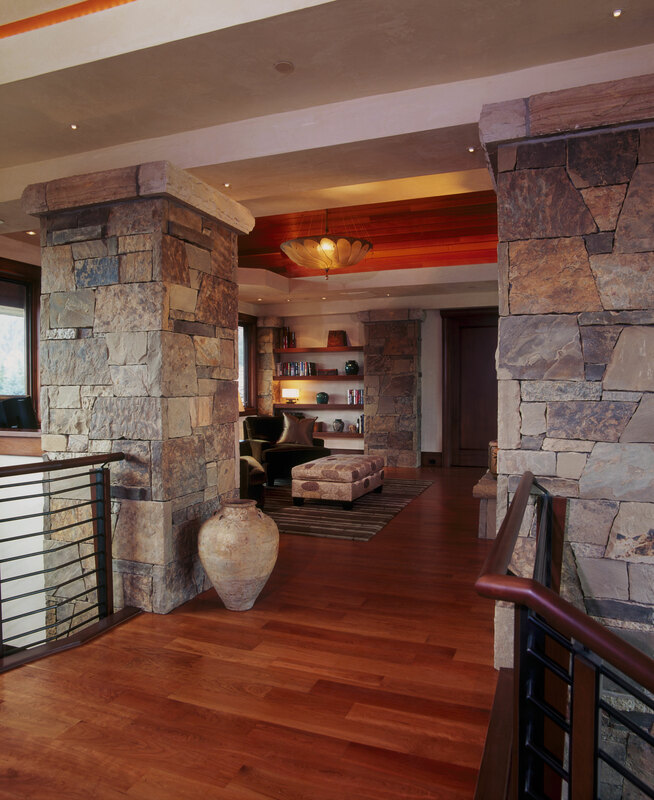 The material palette is typical of a contemporary Colorado mountain Style home, however, the detailing sets it apart from the norm. 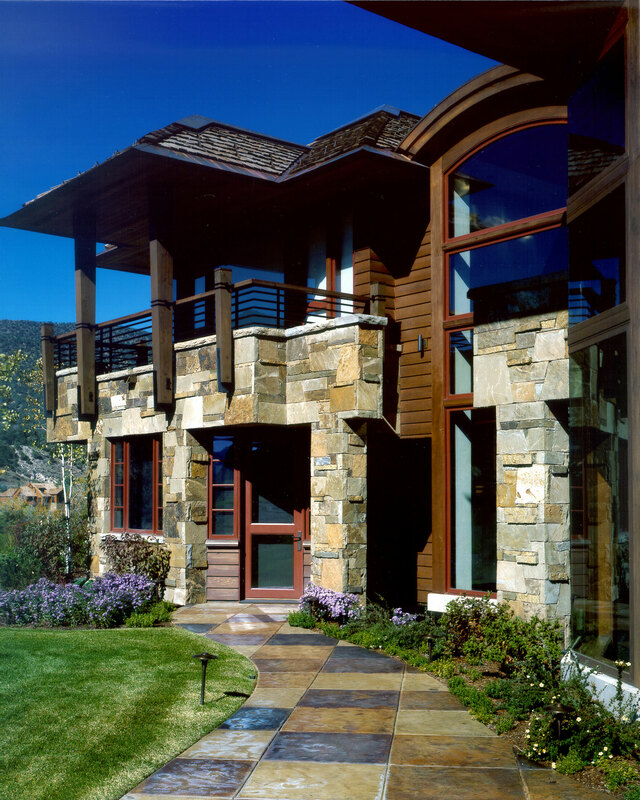 The stone veneer is a custom blend with careful attention to the pattern. 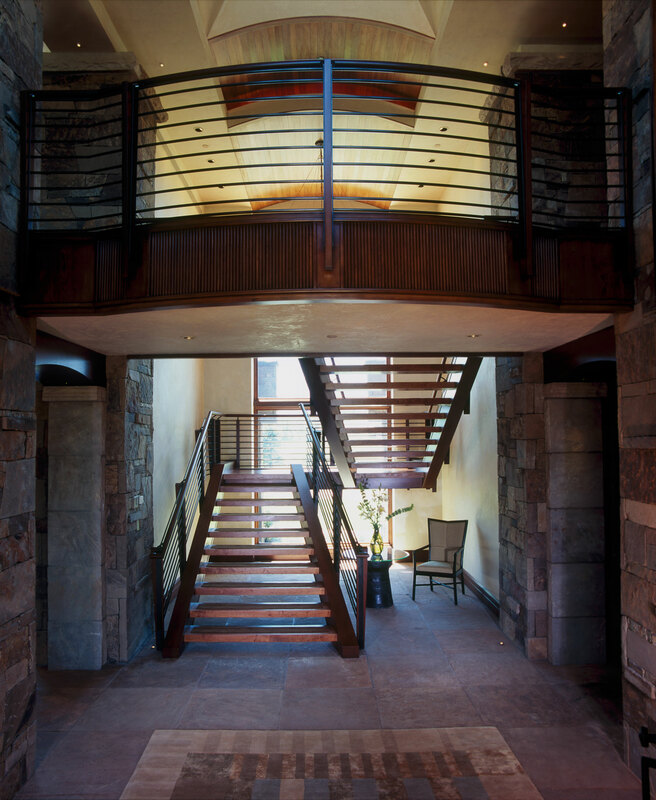 The Douglas fir timber columns and newel posts are slightly splayed and supported by steel knife plates. 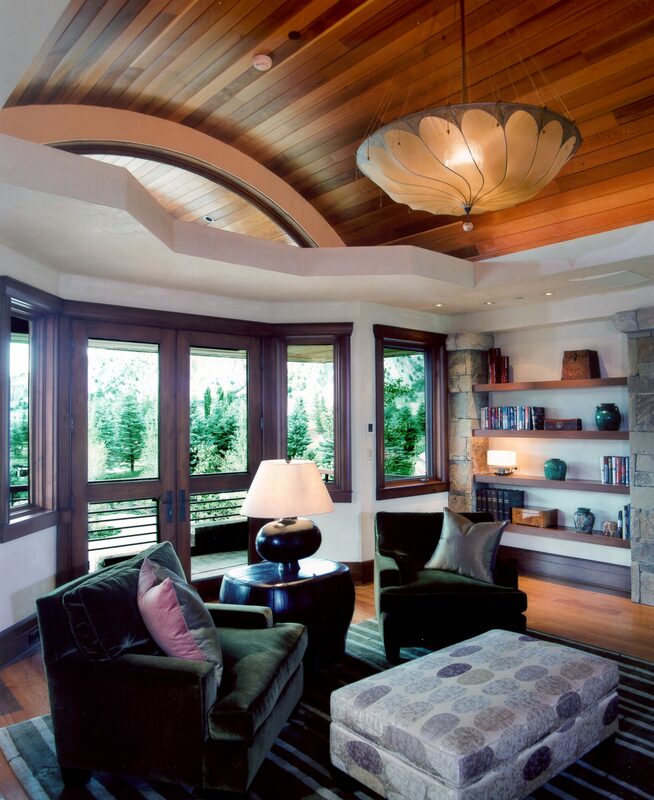 The columns reach up and touch the Cedar soffits with broad overhangs. A copper knife-edge detail was used rather than traditional fascias to add an Asian inspired quality to the exterior. 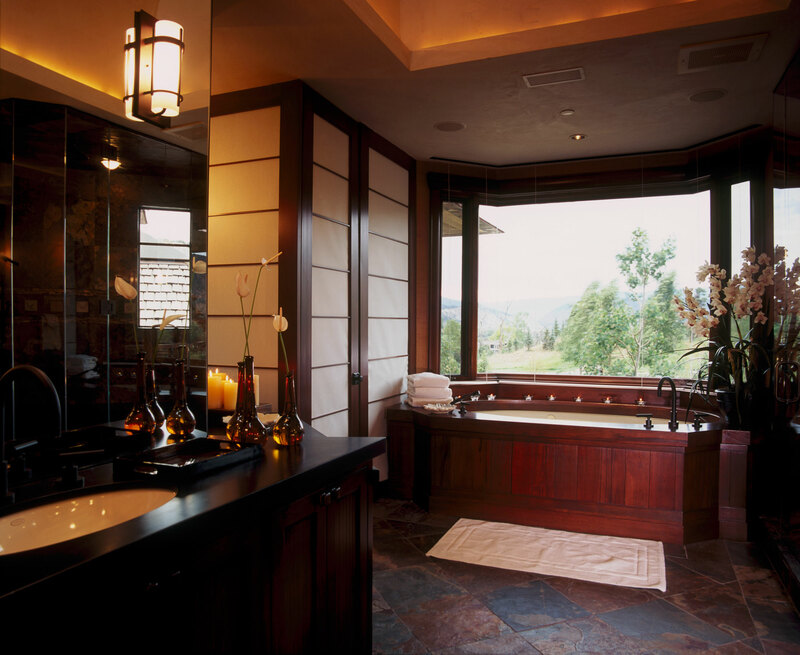 The Asian quality could be equated to a Mountain Zen Sanctuary, which is what has ultimately been used to describe this project. 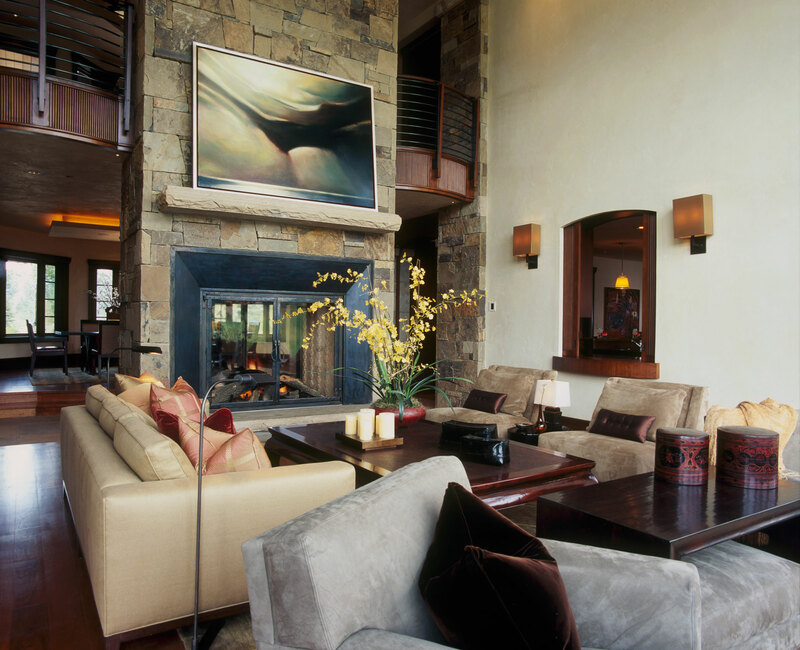 The interior detailing and furnishings further emphasize the overall desire to make the home a comfortable place of refuge. 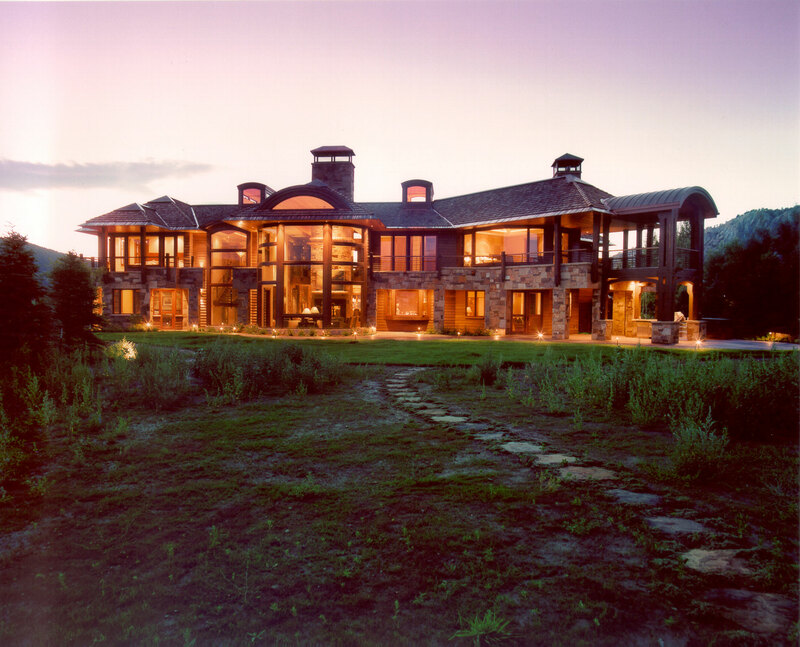 The use of the same exterior stone in the interior and large expanses of glass really create a connection from the interior spaces to the gardens and views of the exterior. 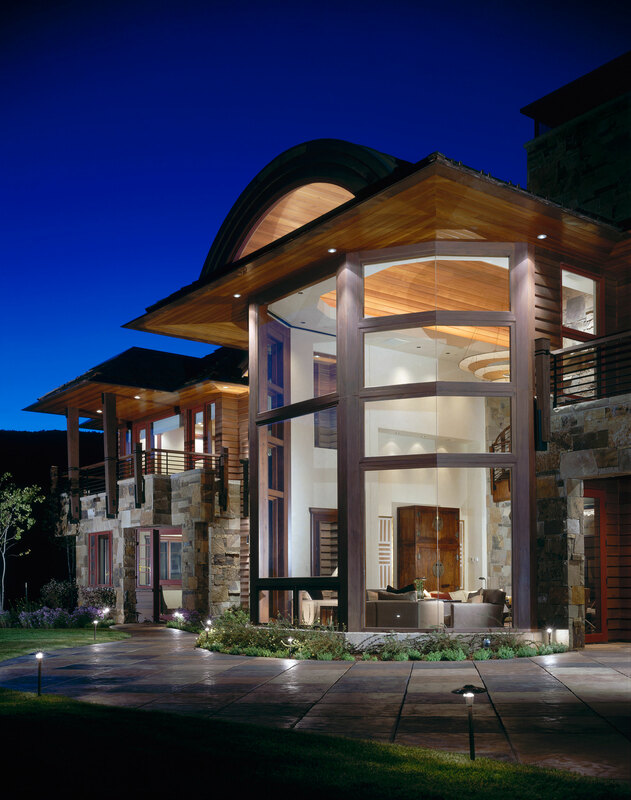 To further reinforce this connection, outdoor living areas have been paired off most of the major living spaces. The use of the soffit material re-manifests itself in the Barrel vault, which connects the Great Room to the upper level Library and then continues out above the exterior balcony. 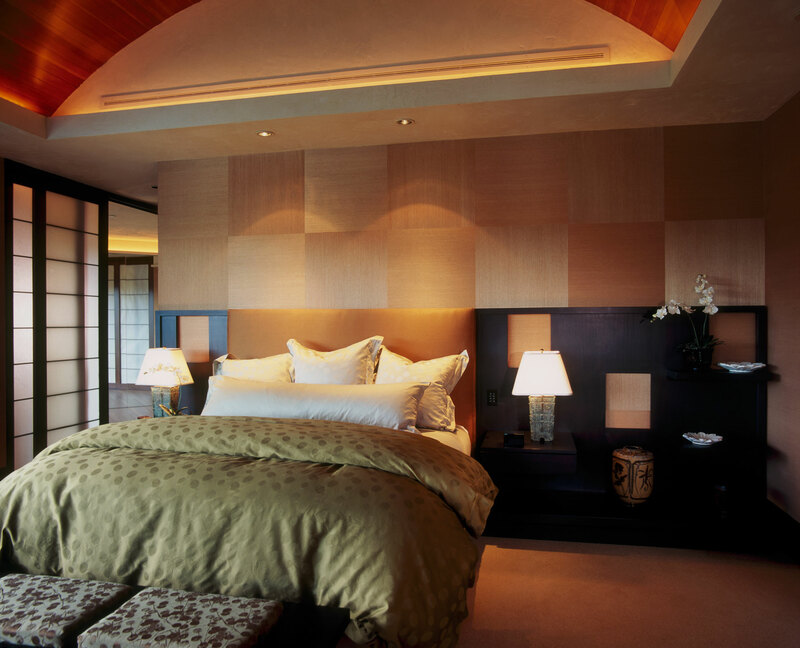 The success of this project is apparent in its reference to a ‘Mountain Zen Sanctuary’. The architects were able to capture the views with sensitivity to the spatial arrangements of the clients program, while detailing the project in a way that evokes intrinsic serenity.